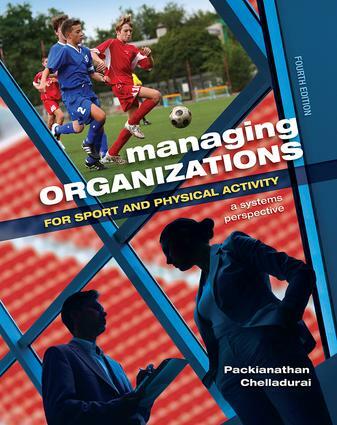 Managing Organizations for Sport and Physical Activity, fourth edition, presents a clear and concise treatment of managing organizations in sport and physical activity. The four functions of management--planning, organizing, leading, and evaluating--provide a general framework that represents the simplest and best approach for introducing readers to the intricacies of management. For each management function, Chelladurai presents relevant theories and their practical applications, citing those theoretical models that are most appropriate to the unique aspects of the sports industry. He uses the open systems perspective, placing organizations in the context of their environment and emphasizing the manager's role in adapting and reacting to changes in that environment. To apply theory to sport management practices, Chelladurai provides numerous examples from the fields of physical activity and sport, including professional sports, intercollegiate athletics, health and sports clubs, and recreation/fitness programs. A chapter on service quality, which describes the notion of quality in sport management services--from the local fitness center to the pro sport arena. It also discusses the measurement of service quality and the gaps in translating customer expectations into the desired service. A new feature providing "An Expert's View," which offers additional perspectives on relevant topics contributed by scholars who research and publish in a specific area. New sidebars on current topics relevant to the field of sport management; some examples include US Track and Field's SMART goal setting as well as genes and technology of leadership. Developing Your Perspective. Thought-provoking questions ask learners to apply theoretical information to contexts relevant to them from their current experiences or in their future careers. Managing Your Learning. Key points from each chapter enhance comprehension. Strategic Concepts. Key terms lists provide for a shared vocabulary in discussing the major concepts of management. In Brief. Short summaries of the important points in a section help crystallize concepts. To Recap. Brief boxes revisit key concepts discussed earlier in the book. Extensive references to journals, scholarly texts, and relevant websites.